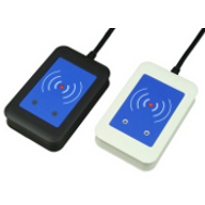 Desktop Reader for 13.56MHz Mifare & NFC RFID transponders - USB or RS232 connection. The TWN3 Mifare Desktop is a small NFC/RFID reader/writer that can be attached to any PC using either USB or RS232 conection. It gives read distances of up to 100mm depending on the RFID tag used. TWN3 reads tags that meet the ISO 14443A standard and the Mifare Classic and Ultralight standards. It supports NFC passive mode. The reader interfaces with its host using either keyboard emulation, a virtual COM port or using direct access to the built in RFID module. The reader is controlled with a scripting language that can allows it to be pre-programmed with, for example, multiple log-on procedures, allowing the TWN3 to be used for single sign-on applications. TWN3 can be used with Windows Vista, Windows 7 (32 & 64 bit) and with Linux. The TWN3 Mifare Desktop RS232 version uses a separate power supply. The USB version is USB powered.